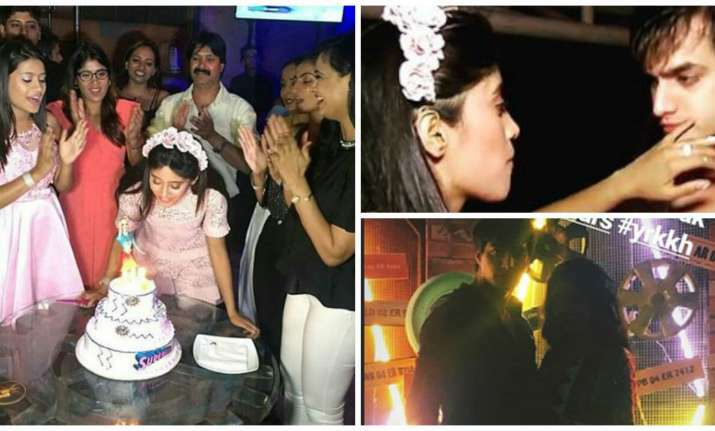 TV actress Shivangi Joshi turned a year older recently and on this occasion, she threw a birthday bash for her close friends. The party was attended by Yeh Rishta Kya Kehlata Hai co-stars and of course her boyfriend Mohsin Khan. The birthday girl looked adorable in a baby pink dress with matching headband. Mohsin was by her side till the end of the party and the duo looked quite elated in each other’s company. The main attraction of the bash was the supergirl cake. The three-tier cake had an edible figurine on the top of it. If pictures and videos are anything to go by, then we can surely say that the couple had a gala time together. The couple also did a romantic dance and we know you don’t want to miss it. Shweta Tiwari also attended the party. Shweta and Shivangi are very fond of each other since the time they shared the screen space in Begusarai. Fan pages of Shivangi and Mohsin posted several inside pictures and videos from the party. Check them out here. Shivangi shot to fame with her character of Naira in Star Plus hit daily soap Yeh Rishta Kya Kehlata Hai. On a related note, Shivangi and Mohsin fell in love on the sets. They started seeing each other and their friendship gradually blossomed into love. The duo never attempted to hide their relationship and are often spotted hanging out with each other.